AUSTRALIAN CHAMBER ORCHESTRA present Tour Three GLITTERING FROST at City Recital Hall, Angel Place, Sydney. More music. This time a concert given by the Australian Chamber Orchestra featuring Martin Frost, a clarinettist. I write this simply as an amateur to music practice (see post: Mahler 9; Another World). This is a concert that I really encourage all theatre goers to see – for although it is a Music event, the theatre of Mr Frost, as an inspired artist, is as exciting to see as it is to hear the music. You get it all in one wonderfully inspired “package”. Martin Frost plays, generously, four pieces of work in this concert. 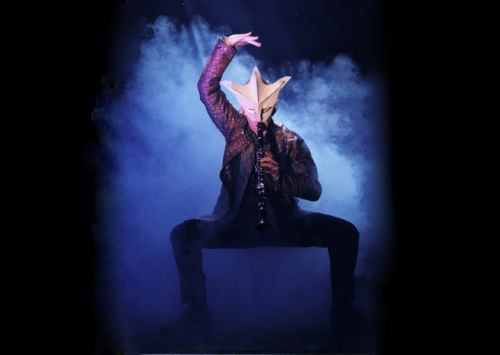 First, a marvellously intriguing contemporary work by Anders Hillborg: Clarinet Concerto PEACOCK TALES (Composed 1198; version with strings and piano composed 2003) which requires him to play the clarinet as well as dance, with and without a mask, accompanied by atmospheric lighting changes. Then, a classical formulation by Brahms of some folk influenced Hungarian Dances, WoO No’s 1, 12, 13, 21 (1869–1880) –arranged for clarinet and strings by Goran Frost (plus a Klezma inspired piece written by Goran Frost, especially for his brother). Lastly, after the interval he gives us the classical Aaron Copland Clarinet Concerto which premièred in 1950. When Mr Frost appears he arrives with such energy that he creates an anticipatory aesthetic arrest. One holds one breath. There is an intimation of a “genius” arriving, at least something special, something extraordinary, brimming with the power of other-worldly artistic possession which vividly translates into a totally amazing dexterity of his instrument handling and control. Well worth seeing, experiencing, for the fillip he may give you from his whole performance persona. Mr Frost will make you glad to be alive. But besides the miracle of Mr Frost, the Australian Chamber Orchestra serve well as support and clarification to the music making of that wailing clarinet, from deep down guttural to high pitched squeal. Under the guidance of Richard Tognetti, on the outer edges of the program, we first hear a splendid reading of Wolfgang Amadeus Mozart’s Serenade No. 13 in G major, K.525, “Eine kleine Nachtmusik”. And in the final offering of the concert a totally resplendent telling of Maurice Ravel’s String Quartet in F major (1902-1903), arranged for string orchestra by Richard Tognetti. The Ravel is luscious and seemed to connect me to the score arrangements, of say Franz Waxman, Miklos Rosza and especially Bernard Hermann in support of many of Alfred Hitchcock’s visuals: REBECCA, SUSPICION, SPELLBOUND, VERTIGO, NORTH BY NORTHWEST and PSYCHO. They all came rushing back and urged me to, perhaps, have a Hitchcock Festival with my DVD machine and television screen one winter weekend soon. This was such a great concert. To miss the concert will be regrettable, but to miss Martin Frost with this orchestra may be a tragedy. Do go. Last chance Saturday at 7pm at Angel Place. If you don’t believe me, read Mr Peter MacCallum’s review In the Sydney Morning Herald on Tuesday, 24th May.